Fitnesse is an application testing tool which allows you to test your business logic. As the name suggests FITnesse, it’s a Functional Integration Testing (FIT) tool. Although some people use it as Unit Testing tool but it is totally an integration testing tool which helps developers and testers to do the functional testing of their code when all the layers get integrated with each other, One can create test cases for UAT (User Acceptance Testing) or FAT (Functional Acceptance Testing) and get then executed on the integrated environment. This tool is very helpful one or more number of teams are working on different layers, each doing the Unit Testing of their code, so you always need to test how the application is performing in the integrated environment, so this is tool which is best fitted to execute all the acceptance test cases and check if the application if performing well in integrated environment. You must be wondering as of now, can we do UI Automation testing, the answer is no it is not a UI Automation tool but yes it can be integrated with various another tools like Selenium for the UI Automation testing. 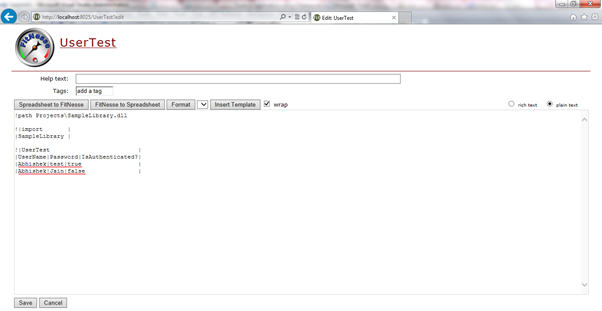 This tool standalone only helps in testing the layer just below your UI either it is Façade or a Business Logic Layer. As I mentioned above that this tool can also be used by Quality Testers because one don’t need to know any specific technology or language to create down the test cases and execute them, it works on a very simple scripting which can also be done by testers by just spending few hours learning the scripting concepts even without any knowledge of programming languages. The best part I like is that without putting much effort, the technical leads can check if the server validations are all into place or not. In today’s world we often say that validation should be both Client Side and Server Side (I will not say all the validations but yes many of them are required on both sides), With UI Automation tools you don’t often end with checking your Server Side validations but as in this tool you are directly interacting with your Business Logic so one can easily check these on Server Side and can get the leakage fixed. 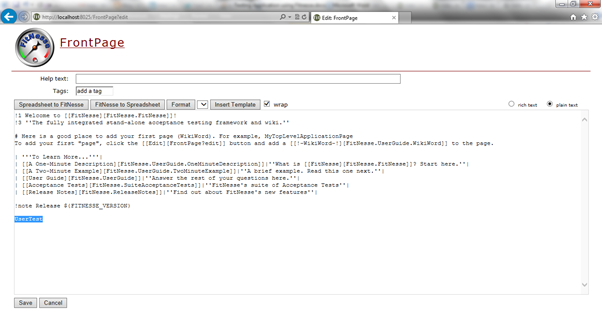 We will see how easy it is to test a sample class created by developers, by just using the Dashboard of Fitnesse. So just before starting, we need Fitnesse on our machines if you don’t have, please follow the link and download the same. Scope of my article is to help you work with Fitnesse for .Net. You also need to download the FitSharp which actually helps Fitnesse to run the methods in the library, so it basically acts as an engine which allows Fitnesse to execute the test cases or you can say the code and generate a required output page for the results. There are two types of testing engines supported by Fitnesse. 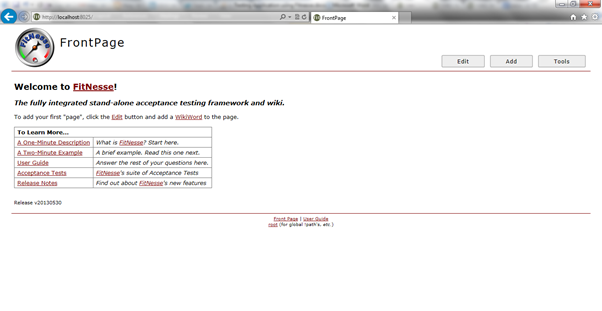 FIT – FIT is the test engine which helps in invoking test cases, interprets Pages (Wiki Pages) and generates results. More than a testing engine it is a testing framework in itself on which the Fitnesse is built upon. The only problem which was faced by the Developers or the code writer is that to make test fixtures they need to inherit their class with ColumnFixture class which in itself is a very heavy construct. SLIM – Because of the limitation of inheritance in FIT engine, comes the SLIM engine. SLIM is Simple List Invocation Method which runs on a separate server which is ultimately invoked by the Fitnesse Server. The only responsibility of SLIM is to invoke the test cases or the methods. Now the developer can simply write their libraries as they want to without worrying about the inheritance model. Additionally it is very light-weight. While making the download, please make sure that for which .Net Framework version you want it to run with. Don’t feel panic if you have different components of the application which are on different .Net Framework version because you can make multiple hosting’s in that case each testing a particular component using the FitSharp DLL(s) of that version. Now after downloading just unzip the FitSharp package. Now copy down below mentioned DLL(s) and EXE(s) at the same path where your JAR is present. Create a Folder named FitSharp (I have created this folder so as to keep the directory structure neat and clean) at the same location where your JAR is and copy down the following DLL(s) and EXE(s) there. Now as soon as you do this you are done with all the components you required and we can go ahead with the installation. 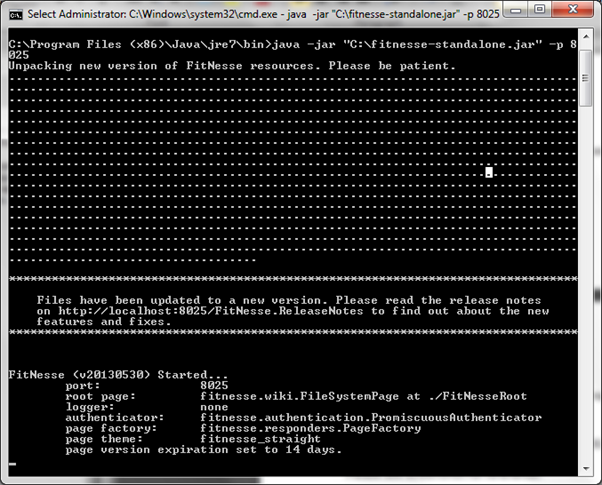 Before installing Fitnesse with the JAR file please make sure that the Java is installed on your system. So what we are doing here is installing the JAR file with the help of Java installed on our system. Path of the Jar file is the physical location where you have copied the JAR. In my case it is present in “C” drive. 8025 is the port is mentioned, by default the installation is done on Port 80, so if you are having another Web site or Web Application running on Port 80 or you want to run Fitnesse on some other port of your choice just mention the Port as –p <PortNumber>. We are done with the installation of Fitnesse, now we have to configure down Fitnesse to use FitSharp testing engines, which can be very easily done from the dashboard only. Here below I will show you how you can configure booth FIT and SLIM engine and how will we create test classes or fixture for the same. And then after that we will see that how to create different test pages and write down scripts to execute test cases by writing scripts or say creating Decision Tables (term used in Fitnesse). 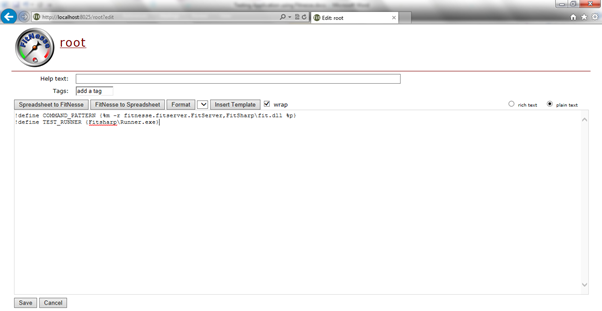 Click on the Edit Button and write down the following commands to configure FIT Engine. All the paths mentioned above for the DLL(s) and EXE(s) are relative to JAR file of the Fitnesse. Here we are using fit.dll which says that by default FIT Engine will be used and in the above case we haven’t specified any particular test engine which by default tells Fitnesse to use FIT engine. Now we are done with the Fitnesse test engine configuration with FIT, let’s now look into how to create a Test Class for it. For this open Visual Studio, create a class library project (Framework used should be same as for which you have downloaded FitSharp package). Add a reference of “fit.dll” in your project and add a class in it, refer following code for example. So here you can see that the Test class is being inherited by ColumnFixture. All the paths mentioned above for the DLL(s) and EXE(s) are relative to JAR file of the Fitnesse. Here we are using fitSharp.dll and SLIM is defined as Test Engine. Now we are done with the Fitnesse test engine configuration with SLIM, let’s now look into how to create a Test Class for it. For this open Visual Studio, create a class library project (Framework used should be same as for which you have downloaded FitSharp package). Add a class in it, refer following code for example. With this we are done with the configuration part, now let’s see how to create Test Pages in Fitnesse, for this go to the Front Page and Edit that Page. Now add the name of the Page which you want to create in the end or in on the top or may be anywhere you want the reference of your test page as shown in the screenshot. In the above screenshot you can see that I have created a new page named “UserTest”. When you will click on save you will see that there is with your page name, and your page is not clickable, this shows that the page is new and now you can define your test on this page. In the example below I will show you that how I will test the code in UserTest class of mine but before that we should understand what the relevance of adding a page is. Test – This is the simple test page on which you will write down your script or will create Decision tables to carry out test runs. Static – Static Page are the pages on which we can’t execute any test runs. So what’s the use of this page, this page is useful suppose in a scenario that the new library is being developed by the time it gets developed Testing team can write down the scripts to test the library but they don’t want the test run to be executed after they have created that page(Yes, test run is done by clicking “Test” on top of that page so you must be wondering why not a create a Test Page and don’t click on this button, but suppose think of a scenario in which there is an automated system which runs the test cases so that system will not now that if the test run needs to be executed on this page or not, and so we can make it as Static, Fitnesse will decide that the test run need not to be executed for this page). Suite – Suite is nothing but the group of Test pages, it basically is the way of keeping all the related Test Pages in one set and when we want a particular set of test cases to be executed we just run the test on Suite instead of running test cases on each test page separately. 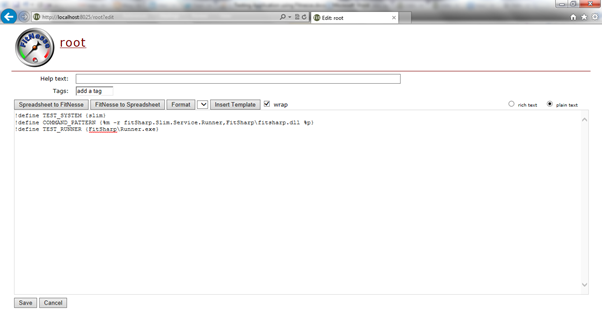 Now coming back to creating a new page, now click on the”?” sign shown with your page name on Front Page of Fitnesse. As soon as you will click on “?”, your page will get opened now it’s time to write down some scripts on this page to run the test cases. Now we will see how to import your library which needs to be tested and how to create the decision table for executing the test cases. Although there are many scenarios which can be there with your test cases or your test cases need to cover, but it will not be possible to explain all of them. I will just be presenting your with an simple example and for other scenarios of yours you can click on the link “User Guide” on the Front Page. As soon as you will open yours newly created page it will present you with a Rich Text Editor, to do the configuration of the test libraries and create Decision Tables. For doing the configuration on this Page and tell it the path of test libraries (Libraries which needs to be tested, in my case it is Sample Library). So to make it easy and keep it separate from the development process, what we will do it create a Folder named “Projects” (This name can be of your choice) at the same path where the Fitnesse JAR file is present, Now Build your project and copy the DLL(s) of your project into this folder. This is done to keep the things separate from the development process and also we can give the relative path of this Projects folder in the page configuration (Relative paths are relative to the location of the JAR file.). Add following on your page to configure the path of the library and importing down a particular namespace in that library for which we will create the Decision tables. This is also an Decision table which we have created for the import, just to very safe and tell Fitnesse that the new Decision Table is getting started we add sign of “!” in the front of the first row of the table. So what is done in above decision table is First Row tells the name of the class, in Second row we specify the sequence of the parameters or Properties of that class in library, order in which we are going to provide the inputs, As everything is Pipe (“|”) separated in Fitnesse, so the first parameter is Username and second is the Password and Last one is the Method which needs to be executed. In third row we have created the first set according to our scenarios, in which we are defining the Properties values and the final expected result. 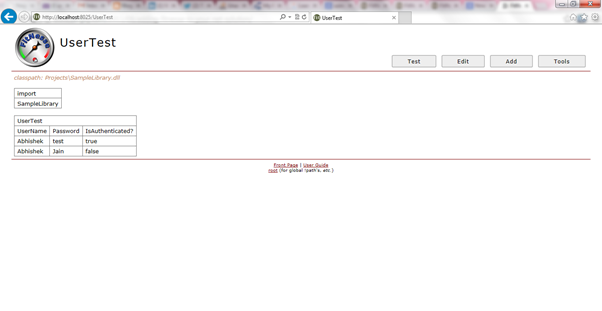 And yes we are done with our First Test case, now it’s time to execute it by saving this on the Test page. 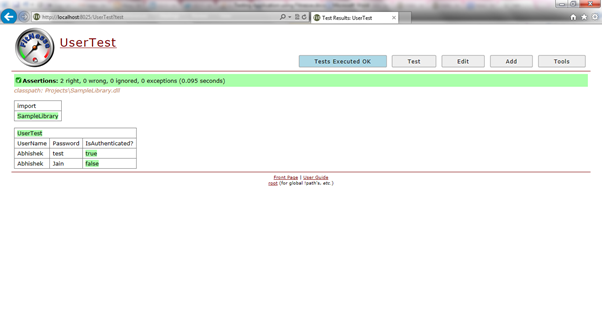 Now here you can see the result both of my test cases passed. With this I think I am done, please let me know in case something is missed or you need some more help on Fitnesse. Hope it helps, please provide the valuable feedback.